PITTSBURG, Kan. (March 11, 2016) – Freshman Sydney Gidabuday ran to a 5000 meter crown at the NCAA Division II Championships on Friday to highlight Adams State University on day one of competition from the Robert W. Plaster Center. 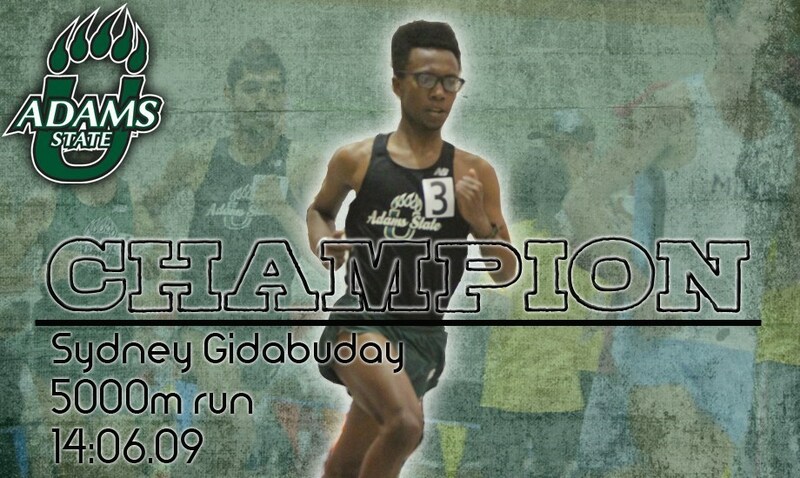 Gidabuday's first place mark along with a fifth place finish from the Distance Medley Relay (DMR) team currently position the Adams State University men in second place with 15 team points. Gidabuday's 5000 meter time of 14:06.09 was enough to fend off Bryce Bradley of Grand Valley State University by 1.84 seconds. The title gives the freshman his sixth overall first place finish during the indoor season. Furthermore, he's now won the last four events he's raced dating back to his mile win at the UW Open on February 14th. After 10 points from Gidabuday, the DMR team of Brian Baum, Robert Guinn, Kale Adams, and Oliver Aitchison supplied five team points by virtue of placing fourth in a field of 12. The Grizzlies finished in 9:49.90 in a highly contested race. Of the top eight teams, less than five-seconds separated the first through eighth place finishes. Saturday's final in the mile will see a contingent of four Grizzlies after a superb showing in Friday's preliminary. Holding true to his national top time, Aitchison finished first in the mile prelim with a mark of 4:04.91. Also advancing were Baum in fifth (4:06.27), Chandler Reid in sixth (4:06.30), and Jackson Sayler in ninth (4:06.90). Also advancing into a Saturday final was Jurgen Themen in the 60 meter dash. The school record-holder in the event managed a time of 6.755 to keep his indoor season alive for another day. Themen placed fifth overall but was third in his heat. Rounding out the ASU men competitors on Friday were Chaz Butler and Dominic Cabada. Butler tabbed a time of 22.10 for 17th overall in the 200 meter dash as Cabada placed 16th in the 5000 meter run at 15:12.10. With a third place finish in the DMR, the ASU women stand in a three-way tie for 16th in the team standings. The group of Roisin Flanagan, Jessica Scherrer, Leanne Allen, Noel Prandoni collected six team points in the event with a time of 11:28.53. Individually, Chante Roberts placed second overall in the 800 meter prelim at 2:09.43. Roberts was ultimately the top finisher in her heat and is poised to finish strong in tomorrow's final. Meanwhile, Kelsey Corbin was unable to advance in the mile final with a time of 5:03.55 to position her in 16th place. Action resumes tomorrow at approximately 12:55 pm MT with the men's shot put. Adams State will be represented in the event with Zach Baxter and Sam Reid. The final event of the day is scheduled to begin at 6:15 pm MT in the form of the women's 1600 meter relay.